The first issue was published on February 16, 1990. In 1996, the magazine won the coveted National Magazine Award for General Excellence from the American Society of Magazine Editors. EW won the same award again in 2002. In September 2016, in collaboration with People, Entertainment Weekly launched the People/Entertainment Weekly Network. The network is "a free, ad-supported online-video network carries short- and long-form programming covering celebrities, pop culture, lifestyle and human-interest stories". It was rebranded as PeopleTV in September 2017. The magazine features celebrities on the cover and addresses topics such as television ratings, movie grosses, production costs, concert ticket sales, ad budgets, and in-depth articles about scheduling, producers, showrunners, etc. It publishes several "double issues" each year (usually in January, May, June and/or August) that are available on newsstands for two weeks. The magazine numbers its issues sequentially, it counts each double issue as "two" issues so that it can fulfil its marketing claim of 52 issues per year for subscribers. Entertainment Weekly follows a typical magazine format by featuring a letters to the editor and table of contents in the first few pages, while also featuring advertisements. While many advertisements are unrelated to the entertainment industry, the majority of ads are typically related to up-and-coming television, film or music events. "Sound Bites" usually opens the magazine. It’s a collage of media personalities; actors, presenters or comedians, alongside their recent memorable quotes in speech bubble form. "The Must List" is a two-page spread highlighting ten things (books, movies, songs, etc.) that the staff loves from the week; it usually features one pick from EW readers. "First Look", subtitled "An early peek at some of Hollywood's coolest projects", is a two-page spread with behind-the-scenes or publicity stills of upcoming movies, television episodes or music events. "The Hit List", written each week by critic Scott Brown, highlights ten major events, with short comedic commentaries by Brown. Typically, there will be some continuity to the commentaries. This column was originally written by Jim Mullen and featured twenty events each week, and Dalton Ross later wrote an abbreviated version. "The Hollywood Insider" is a one-page section that reports breaking news in entertainment. It gives details, in the separate columns, on the most-current news in television, movie and music. "The Style Report" is a one-page section devoted to celebrity style. Because its focus is on celebrity fashion or lifestyle, it is graphically rich in nature, featuring many photographs or other images. Recently,[clarification needed] the page converted to a new format: five pictures of celebrity fashions for the week, graded on the magazine's review "A"-to-"F" scale (see Reviews section below). A spin-off section, "Style Hunter", which finds reader-requested articles of clothing or accessories that have appeared in pop culture recently, appears frequently. "The Monitor" is a two-page spread devoted to major events in celebrity lives with small paragraphs highlighting events such as weddings, illnesses, arrests, court appearances, and deaths. Deaths of major celebrities are typically detailed in a one-half- or full-page obituary titled "Legacy". This feature is nearly identical to sister publication People's "Passages" feature. "The Final Cut" is written by former executive editor and author Mark Harris. Harris' column focuses on analyzing current popular-culture events, and is generally the most serious of the columns. Harris has written about the writer's strike and the 2008 presidential election, among other topics. "Binge Thinking" was written by screenwriter Diablo Cody. After several profiles of Cody in the months leading up to and following the release of her debut film, Juno (2007), she was hired to write a column detailing her unique view of the entertainment business. If You Ask Me..." Libby Gelman-Waxer (Paul Rudnick) was brought in to write his former Premiere column for Entertainment Weekly in 2011. There are typically four to six major articles (one to two pages each) within the middle pages of the magazine. These articles are most commonly interviews, but there are also narrative articles as well as lists. Feature articles tend to focus mostly on movies, music and television and less on books and the theatre. In the magazine's history, there have only been a few cover stories (e.g., John Grisham, Stephen King) devoted to authors; there has never been a cover solely devoted to the theater. There are seven sections of reviews in the back pages of each issue (together encompassing up to one half of the magazine's pages). In addition to reviews, each reviews section has a top-sellers list, as well as numerous sidebars with interviews or small features. Unlike a number of European magazines that give their ratings with a number of stars (with normally 4 or 5 stars for the best review), EW grades the reviews academic-style, so that the highest reviews will get a letter grade of "A" and the lowest reviews get an "F", with plus or minus graduations in between assigned to each letter except "F". Typically features all the major releases for that weekend, as well as several independent and foreign films that have also been released. Chris Nashawaty is the primary film critic. "Critical Mass" was a table of the grades that have also been given by a number of noted movie reviewers in the American press (such as Ty Burr from The Boston Globe, Todd McCarthy from Variety and Roger Ebert from the Chicago Sun-Times). Also eliminated from this section was the box-office figures from the previous weekend and some sort of infographic. The A+ rating is rarely awarded by EW. Two films to have received it are Citizen Kane and My Left Foot (1989). DVDs are now profiled in the one-page "Movies on DVD" section that follows. Longtime critic Lisa Schwarzbaum left the magazine in 2013, and critic Owen Gleiberman was let go after a round of layoffs in spring 2014. In 2015 it started publishing the scores of movies from Metacritic, Rotten Tomatoes, and IMDb under "Critical Mass." Features reviews by critics Darren Franich and Kristen Baldwin for made-for-television films and new television program or series, as well as some television specials. The section no longer includes the Nielsen ratings for the previous week. On the following page is typically a "TV on DVD" section, profiling releases of television films and specials or complete seasons of television shows. Current Reviewers include Melissa Maerz. Currently written by Ray Rahman, features brief, one- or two-sentence reviews of several television programs on each night of the week, as well as one slightly longer review, usually written by someone else, with a letter grade. Reviews major album releases for the week, divided by genre. There is also typically at least one interview or feature, as well as a section called "Download This", highlighting several singles available for download from the Internet. Features reviews of books released during the week. Sometimes, authors will write guest reviews of other works. There is also typically one interview or spotlight feature in this section per issue. Bestseller lists appear at the end of this section. Reviews productions currently playing, listed by the city where they are running. Reviews current video game releases. Reviews new websites and products, and profiles current Internet or technology phenomena. * Not in every issue. This section occupies the back page of the magazine, rating the "hits" and "misses" from the past week's events in popular culture on a bullseye graphic. For example, the May 22, 2009, edition featured Justin Timberlake hosting Saturday Night Live in the center, while the then-drama between Eminem and Mariah Carey missed the target completely for being "very 2002". At the time when this was printed on a small part of a page, events that were greatly disliked were shown several pages away. Spring, Summer, Fall and Winter Preview issues: Generally each quarter the magazine reports on upcoming releases in movies, music, television, live shows and books. Typically the summer issue's focus will be on upcoming movies only unless major television series or events, music releases or book releases are occurring then. The Photo issue: Once a year, an issue is dedicated to featuring (aside from the normal reviews and news content) only photographs of celebrities. Unlike tabloid issues, these photographs done with the celebrities' cooperation, and often they use some form of artistic expression. A wide variety of celebrities have been used, including Green Day, Reese Witherspoon, Morrissey, the cast of the television series Arrested Development, Tobey Maguire and Cameron Diaz. Generally, the photographs will contain some descriptive text, sometimes about the person or sometimes a commentary from the photographers who photographed them for a story. Academy Awards issues: In the past the magazine devoted at least four cover stories per year to the Academy Awards; "The Oscar Race Begins" issue in January predicts the nominees, the "Nominees" issue in February profiles the recently announced Oscar contenders, the "Oscar Odds" issue predicts the winners the week before the awards, and the "After-Awards" issue covers the ceremony the week after it airs. Virtually every issue mentions the Oscars in some capacity, often on the cover, and a film or actor's Academy-Award chances are often noted in the magazine's reviews. In comparison, music's Grammy Awards, television's Emmy Awards, and theater's Tony Awards are given relatively limited coverage. The "Must List": A double-sized issue that is usually timed for release in the last week of June. It focuses on what the magazine considers "musts" in entertainment with the latest hot movies, TV shows, music projects and novels along with previews of upcoming projects in those media that are gaining interest. The Fall TV Preview issue: Generally released in early September, this issue has the magazine detailing the upcoming fall season of both new and returning series. End-of-the-Year issue: The last issue of each year, whose cover shows the "Entertainer of the Year" chosen by readers at EW's official website. The issue features the ten-best releases in theater, film, television, music, DVD, literature and (as of last year) fashion that year. Music, television and film have two critics give their top ten; the others only have one. Each section also has a five-worst list (film is the only section in which both critics give the worst). 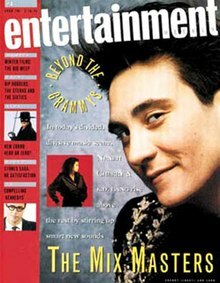 Also in the issue are special sections devoted to the Entertainer of the Year, great performances, newly arrived stars, a timeline of infamous celebrity mishaps, and obituaries of stars who died (this used to be in a separate issue; it was combined with the "end-of-the-year" issue in 2003). This is the only issue without any reviews. The 1,000th issue was released July 4, 2008, and included the magazine's top-100 list for movies, television shows, music videos, songs, Broadway shows, and technology of the past 25 years (1983–2008). As of its 1,001st issue, EW drastically revamped the look, feel and content of the publication—increasing font and picture sizes and making all columns' word count shorter. The magazine's website EW.com provides users with daily content, breaking news, blogs, TV recpas, original video programming, entertainment exclusives and serves as an archive for past magazine interviews, columns and photos. Along with a website, they also have a radio station on Sirius XM. In April 2011, EW.com was ranked as the seventh most popular Entertainment News property in the United States by comScore Media Metrix. Previously named the EWwy Awards, the Poppy Awards was created by Entertainment Weekly to honor worthy actors and series not nominated for the Primetime Emmys. The Poppys are awarded in ten categories and no person nominated for an equivalent Primetime Emmy is eligible. Votes and nominations are cast online by anyone who chooses to participate. The categories are: Best Drama Series; Best Comedy Series; Best Actor in a Drama Series; Best Actor in a Comedy Series; Best Actress in a Drama Series; Best Actress in a Comedy Series; Best Supporting Actor in a Drama Series; Best Supporting Actor in a Comedy Series; Best Supporting Actress in a Drama Series; and Best Supporting Actress in a Comedy Series. ^ a b "Henry Goldblatt, a longtime veteran at EW moving back to his old job as editor". New York Post. Jan 30, 2015. ^ "EW Loses Its Top Editor". New York Post. January 7, 2009. Retrieved June 23, 2018. ^ "New York Times". The New York Times. Retrieved February 10, 2014. ^ Sumner, David E.; Rhoades, Shirrel (2006). Magazines: A Complete Guide to the Industry. Peter Lang. p. 142. ISBN 978-0-8204-7617-9. Retrieved April 10, 2016. ^ "Mag Bag". Media Daily News. October 26, 2007. ^ "Winners and Finalists Database | ASME". www.magazine.org. Retrieved 2017-05-23. ^ "Ask Libby". Entertainment Weekly. 13 January 2012. Retrieved January 2, 2017. ^ "EW Lays Off Longtime Film Critic Owen Gleiberman in Staff Purge". The Hollywood Reporter. April 2, 2014. ^ "Entertainment Weekly Radio - The latest In Pop Culture News - SiriusXM Radio". siriusxm.com. Retrieved 2 January 2017. ^ "ew.com at WI. Entertainment Weekly: TV Recaps, Movie & Music News - EW.com". informer.com. Retrieved 2 January 2017. ^ Bierly, Mandy (September 14, 2008). "'Mad Men,' 'John Adams,' Win Big at Creative Arts Emmys". Entertainment Weekly. Archived from the original on June 24, 2011. Anne Helen Petersen (June 10, 2014). "The Trials of Entertainment Weekly: One Magazine's 24 Years of Corporate Torture". The Awl. Archived from the original on 2014-06-17. Retrieved June 19, 2014. This page is based on the Wikipedia article Entertainment Weekly; it is used under the Creative Commons Attribution-ShareAlike 3.0 Unported License (CC-BY-SA). You may redistribute it, verbatim or modified, providing that you comply with the terms of the CC-BY-SA.